(Nanowerk News) When we catch a cold, the immune system steps in to defend us. This is a well-known biological fact, but is difficult to observe directly. Processes at a molecular level are not only miniscule, they are often extremely fast, and therefore difficult to capture in action. Scientists at Helmholtz-Zentrum Berlin für Materialien und Energie (HZB) and the Technische Uni-versität Berlin (TUB) now present a method that takes us a good step towards producing a "molecular movie". They can record two pictures at such a short time interval that it will soon be possible to observe molecules and nanostructures in real time. This diagram shows the experimental setup. A "molecular movie" that shows how a molecule behaves at the crucial moment of a chemical reaction would help us better understand fundamental processes in the natural sciences. Such processes are often only a few femtoseconds long. A femtosecond is a millionth of a billionth of a second. While it is possible to record a single femtosecond picture using an ultra-short flash of light, it has never been possible to take a sequence of pictures in such rapid succession. On a detector that captures the image, the pictures would overlap and "wash out". An attempt to swap or refresh the detector between two images would simply take too long, even if it could be done at speed of light. In spite of these difficulties, members of the joint research group "Functional Nanomaterials" of HZB and the Technische Universität Berlin have now managed to take ultrafast image sequences of objects mere micrometres in size using pulses from the X-ray laser FLASH in Hamburg, Germany. Furthermore, they chart out a path how their approach can be scaled to nanometer resolution in the future. 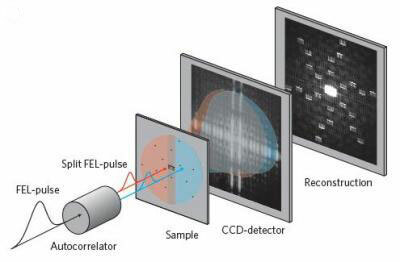 Together with colleagues from DESY and the University of Münster, they have published their results in the journal Nature Photonics ("Sequential femtosecond X-ray imaging"). The researchers came up with an elegant way to descramble the information superimposed by the two subsequent X-ray pulses. They encoded both images simultaneously in a single X-ray hologram. It takes several steps to obtain the final image sequence: First, the scientists split the X-ray laser beam into two separate beams. Using multiple mirrors, they force one beam to take a short detour, which causes the two pulses to reach the object under study at ever so slightly different times – the two pulses arrive only 0.00000000000005 seconds apart. 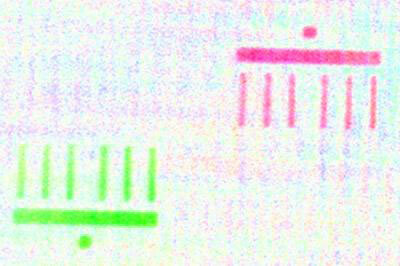 Due to a specific geometric arrangement of the sample, the pulses gen-erate a "double-hologram". This hologram encodes the structure of the object at the two times at which the X-ray pulses hit., Using a mathematical reconstruction procedure, the researchers can then simply associate the images with the respective X-ray puses and thus determine the image sequence in correct temporal order. The imaged Brandenburg Gate is only a few micrometers in size. The scientists took the green and red pictures of the model merely 50 femtoseconds apart. Using their method, the scientists recorded two pictures of a micro-model of the Brandenburg Gate, separated by only 50 femtoseconds. "In this short time interval, even a ray of light travels no further than the width of a human hair," says PhD student Christian Günther, the first author of the publication. The short-wavelength X-rays used allow to reveal extremely small detail, since the shorter the wavelength of light you use, the smaller the objects you can resolve. "The long-term goal is to be able to follow the movements of molecules and nanostructures in real time," says project head Prof. Dr. Stefan Eisebitt. The extremely high temporal resolution in conjunction with the possibility to see the tiniest objects was the motivation to develop the new technique. A picture may be worth a thousand words, but a movie made up of several pictures can tell you about an object's dynamics.